1. Preheat the oven to 180°C, gas mark 4. Mix the oil and mustard together and rub over the beef. Place into a large roasting tin and scatter the vegetables and garlic around the meat, then pour over the wine. Season. Roast for 45-50 minutes for rare or until cooked to your liking, turning the vegetables halfway through. 2. Meanwhile, make the Yorkshire pudding batter. Sieve the flour and a pinch of salt into a mixing bowl. Make a well in the centre, add the egg and whisk, together with the milk, to form a thick, smooth batter. Cover and chill in the fridge for 30 minutes. 3. About 5 minutes before the beef is cooked, divide the oil between 8 holes of a 12-hole muffin tin. Place into the oven for 5 minutes. When the beef is cooked, remove from the oven and cover the tin with foil. Leave to rest in a warm place for 20 minutes. 4. Meanwhile, remove the muffin tin and increase the oven temperature to 220°C, gas mark 7. Divide the batter between the oil-filled holes and bake the puddings for 20 minutes or until golden and risen. 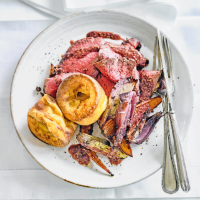 Carve the beef and serve with the vegetables, cooking juices and Yorkshire puds.